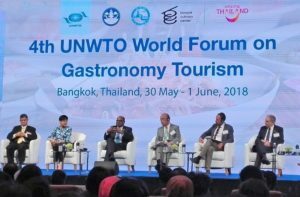 Bangkok (Thailand) – June 1, 2018 (travelindex.com) – A record 475 delegates from 52 countries have turned up for the 4th UNWTO Forum on Gastronomy Tourism which opened today in Bangkok, the first time it is being held in Asia. The conference was attended by dozens of Thai restaurateurs, chefs, food and beverage executives and hoteliers who are getting a chance to update themselves on new techniques and technologies in preparing, marketing and managing the strong linkage between tourism and gastronomy. Organised by the UN World Tourism Organisation and Basque Culinary Centre, the conference is being attended by Secretary General of the UNWTO, H.E. Mr. Zurab Pololikashvili, Hon. Mr. Edmund Bartlett, Minister of Tourism, Jamaica, and Mr. Joxe Mari Aizega, Director, Basque Culinary Center. The San Sebastian Region Bar, Restaurants and Hotels Association had a strong representation with its President Mr. Mikel Ubarrechena Pisón and General Manager Mr. Kino Martinez. The conference is focused on raising awareness both nationally and regionally as to the significance and role of gastronomy tourism as a key towards the development of sustainable tourism in the region. Speakers from Macau, Japan, Indonesia and the Basque region of Spain discussed the current situation in their regions and the global outlook for gastronomy tourism as well how the public and private sector can establish successful partnerships.